The Triple Kirks development in Aberdeen City centre. Developers behind a £20 million plan to transform an Aberdeen church into student flats have lodged plans to make it available to the open market. Dandara wants to overturn a requirement for its 342-bed Triple Kirks development to be solely for students. If approved, it would allow the company to take advantage of a new council policy which was voted in last month. The policy change, designed to boost the population of people living in the heart of Aberdeen, allows developers to waive affordable housing contributions for the next two years if they create residential developments of less than 50 homes within the city centre. In a lengthy document submitted to the city council, Dandara’s solicitor admitted that, without removing the condition, the building will likely not reach full capacity until autumn 2020. It is also suggested that the complex – which was originally planned as an office block – would better fit with the council’s long-term plans to revitalise the city centre if it can also be used by non-student residents. Aberdeen South MP Ross Thomson said: “A drive to get more people living right in the heart of Aberdeen forms a key part of the council’s city centre masterplan. However North East MSP Lewis Macdonald said he believes Dandara is trying to “piggyback” on the council’s new policy. He said: “I think if Dandara are up for building new residential homes in the city centre then that’s great, and should be encouraged. “But I do not think it would be appropriate to try and remove a perfectly sensible condition retrospectively. Aberdeen Central MSP Kevin Stewart added: “There is a huge need for affordable housing in our city, something which is especially required in our city centre. A spokesman for Dandara said the developer would be unable to comment on a live planning application. The controversial new policy to give city centre developers a two-year break from paying affordable housing contributions was voted in at the city council’s planning committee on September 20. 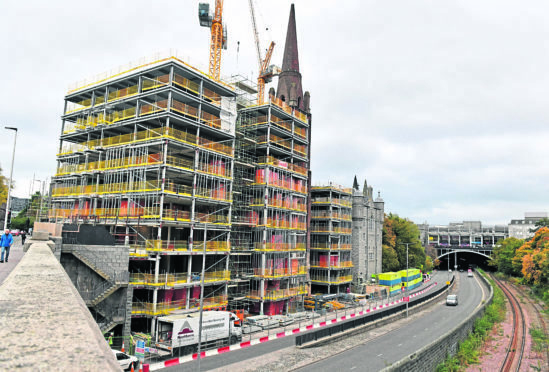 The scheme, which will remain in place until December 31, 2020, allows companies to save cash and has been designed to encourage more residential developments in the heart of Aberdeen. In line with the £1 billion city centre masterplan, council chiefs hope the project will result in an increase in the number of people choosing to live in the centre, and prove to be an attractive incentive for developers considering key sites. It will only apply to residential developments of less than 50 homes within the city centre. Marie Boulton, the convener of the local authority’s planning committee, previously said the move is aimed at re-invigorating the Granite City. She said: “We’re looking to create a vibrant economy and that includes getting living spaces in some of our beautiful listed buildings. “What we will be doing is seeing people living in the city, which will help our cultural sector, with them visiting the theatre, cinemas and all the restaurants. However SNP councillor John Cooke, who lodged an amendment to oppose the move at September’s planning committee meeting, argued that all it would do would “put money in the hands of developers”. Speaking in September, he said: “The effect of this proposal would in my view do nothing to enhance affordable living in the city centre. The planning committee approved the administration’s motion by six votes to two.